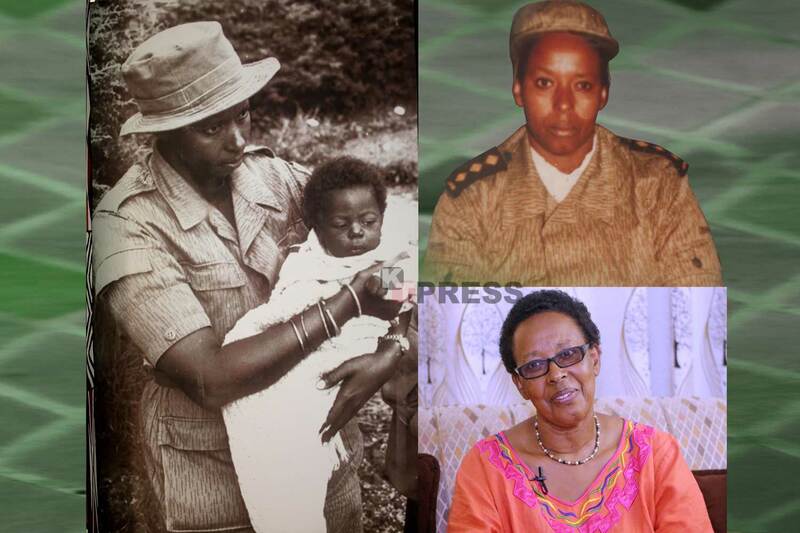 For four years back in 1990s, she donned the rare dotted green rebel uniform and gumboots – both of which were the signature attire of the Rwanda Patriotic Front/Army (RPF/A) rebels. Today, the former feared commander is a complete opposite – chocolate skinned, eye glasses – but still maintains the commanding voice when she speaks. 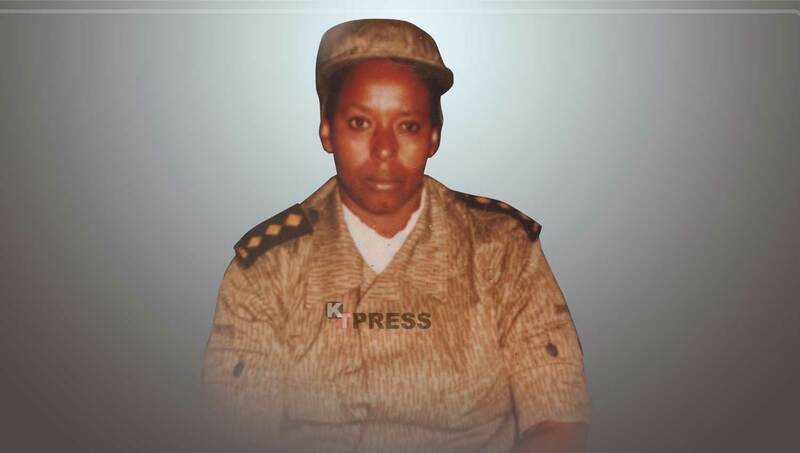 This is the story of retired Captain Dafhrose Intaramirwa. On December 13 last year, President Paul Kagame inaugurated the Campaign Against Genocide museum located at Parliament. 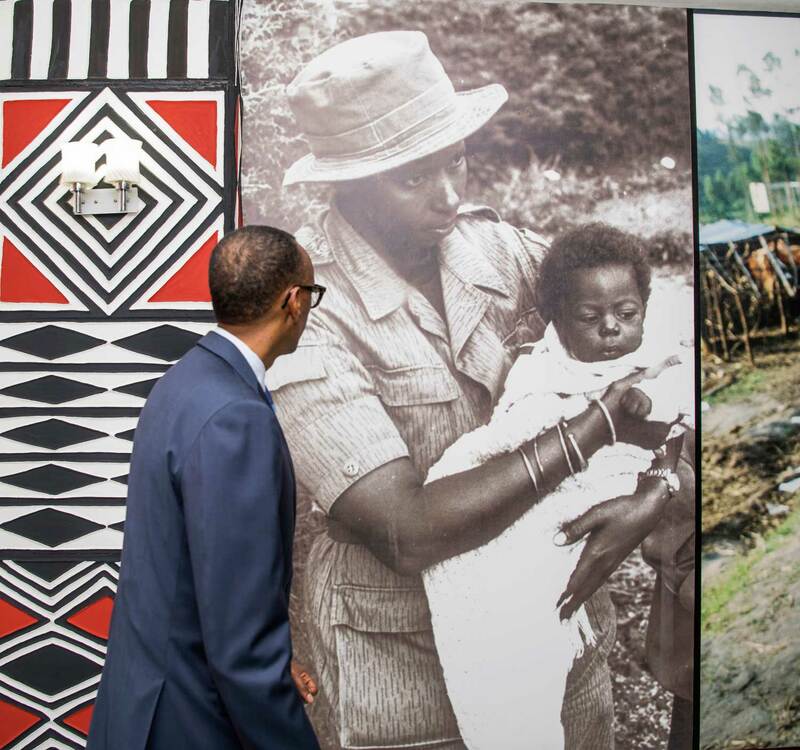 During the guided tour of the history-packed facility, Kagame spent several seconds looking intently at a particular photo: a female rebel soldier fondly holding a baby. The cameras captured that Kagame moment. Reviews in local media about the museum cite this particular photo of the rebel soldier among the spots where ordinary visitors frequently take memorable photos that have been widely shared on social media. KT Press went on a hunting mission to find the faces in that photo. Our search linked us to different people. We tried going through her former comrades, but all we were getting were praises of her, but no indication of how to find her. Some even told us she may have died. A breakthrough came when a rumour went around Kigali Today Ltd company that the editorial team was working on another “big story”. Due to many ground breaking articles that have been published, there was visible eagerness to know who was on our radar this time. Usually at Kigali Today when a big story is being prepared, only a small team including senior editors and the assigned writers know about the scoop. The other staff get to read the story when published like everybody else in the public. Such measures are put in place to ensure we keep giving the competition a tough run for their money. Getting her to talk was uphill task! But for the story of Dafhrose, the idea somehow leaked. Disappointment turned to excitement. A staff member, who is actually senior and was in position to know what was happening, approached the editorial. She politely asked whether it was true we were looking for the female rebel soldier whose photo is in the museum. At first the editorial hesitated to make any pronouncements. There was disquiet for some days as the team handling the story tried to internalize what they had just learnt. However, this staff member had lost contact with Dafhrose, until about a year ago. Along with many others who lived under care of Dafhrose, this staff member knew Dafhrose was alive but had no idea where she lived. From then on, the editorial team worked with her to locate Dafhrose. It was no easy feat! Finally, we managed to establish that Dafhrose lives in Nyagatare district, north-eastern Rwanda. Contact was made over several days, and soon a team was off to meet her. But convincing her to speak to us proved another major challenge. Despite her story, she has maintained a quiet life away from the spotlight. But against all the odds, we managed to convince her to speak. At the start of our interview, first things first had to be addressed. Do you know this photo? When it was taken? From where? By whom? Where is the baby you are holding? In the freezing cold mountains of Byumba prefecture, currently Gicumbi district was where the RPF operated, and by the time the government began executing the genocide against Tutsis on April 7 1994, the region had been already liberated. Hundreds of thousands of people fled many parts of the country into the RPF zone. Hundreds of genocide survivors were rescued from Kigali and transported to Byumba. This photo of Dafhrose holding the baby was taken at Urumuri hotel. Dafhrose was leader of the team taking care of orphans at this facility. The rebels had lived the once-famed Urumuri hotel into a care center for orphans. The hotel had for years been resting place for President Juvenal Habyarimana and his elite entourage. Today, it remains a hotel and has been upgraded. According to a 540 page research book, “Le Mal Rwandais” by Commissioner of Police Dr Daniel Nyamwasa published in April this year, the RPA rebels battled a formidable force. As part of a shaky peace process, the RPF had forced the government into accepting 600 rebel troops to be stationed at CND (current Rwanda parliament). And when the genocide got underway, this small force was up against the government army totaling 25,000 troops in Kigali alone. “It means one RPF soldier had to face 40 government soldiers, known then as FAR,” says Nyamwasa in the book. Across Rwanda, rebel leader Paul Kagame was commanding a total force of just 12,000 troops against 35,000 troops known at the time as Forces armées rwandaises (FAR). “In other words, one RPF soldier was had to face 3 ex-FAR soldiers,” says the acclaimed research. Due to the heroic acts of the RPF rebels, any memorabilia like statues or photos associated with the rebels is considered with treasure here in Rwanda. It partly explains why the Rwanda Defense Force (RDF) remains the sole national institution that commands widespread admiration from ordinary folks. The annual perception index prepared by the Rwanda Governance Board put the army’s popularity at nearly 100 percent. 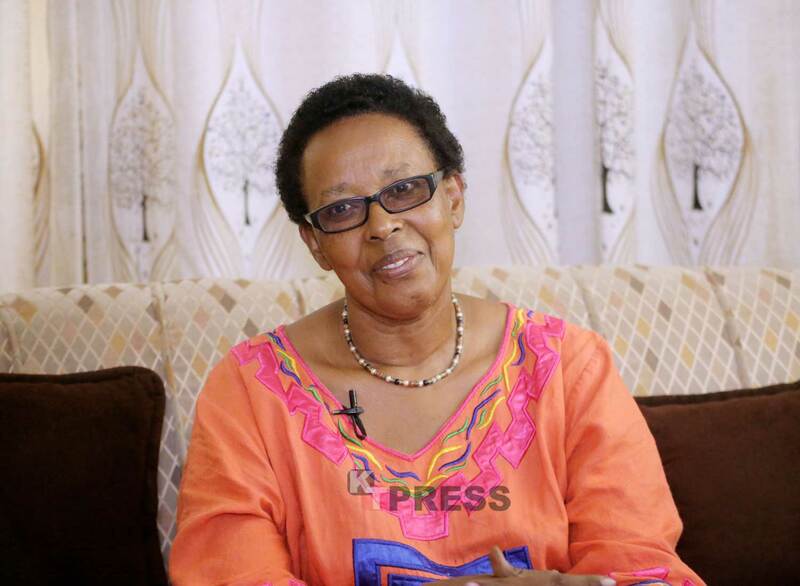 As Rwanda prepares for Liberation Day tomorrow Wednesday – a day to celebrate the 24th anniversary of the liberation, 68year-old Dafhrose is one of those to whom the nation will be expressing appreciation. They gave up everything in their life so millions could live on. Dafrose was born in Gahini, eastern Rwanda. Left Rwanda in the exodus of the time escaping massacres of Tutsis. 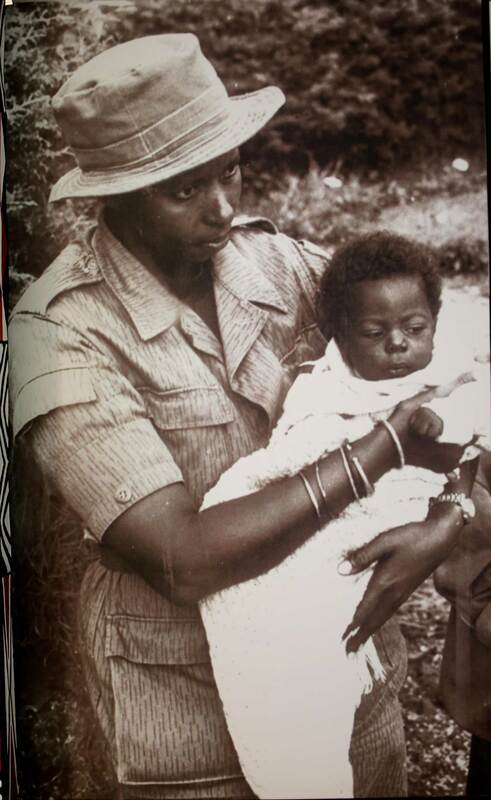 When the liberation struggle was launched in October 1990, Dafhrose was a married mother of six in Bulemezi district, central rural Uganda.. It was a difficult decision to leave her home, but Dafhrose says her Ugandan husband was supportive of her position to join the war effort. Today, Dafhrose has four children and several grandchildren. One of the deceased died before the liberation war, and another died while she was away on the battle field. “It pains me so much that I was not able to burry my baby, but am sure that child is resting peacefully because the struggle was worth it,” says Dafhrose. On frontline, no one knew she was a mother, only after one of her children also joined the liberation war. We spent more than 8 hours with Dafhrose. And all through, regular phone calls were coming in. That was followed by endless laughter as she engaged the caller. In the few minutes, they had spoken up several things. Some were calling to ask how she was feeling. Others just to share with her their nightmares of the previous night. All were either her family members or one of the orphans from Urumuri hotel. During the interview, when we asked her to paint for us a picture of what it was like having to see all those kids every day, tears began rolling down her glasses. The pace of the interview slowed down to allow her time to regain composure. There are said to have been about a hundred orphans at Urumuri hotel. After the genocide had been stopped across Rwanda in July, the orphans under RPF care centers were settled in orphanages. Aid agencies had poured into the country, and there were also countless local NGOs. Dafhrose says some children refused to leave her and she went on to live with them in Kigali. In the preceding years, some orphans linked up with family members. Each one of them, like the Kigali Today staff member who helped us located Dafhrose, has a painful story to narrate. And where is the baby Dafhrose is holding in that photo? The boy was delivered to Urumuri hotel by the father. He handed the baby to Dafhrose in person and joined the rebels on frontline. After the RPF had taken over the country in July, the father of the baby returned to pick the child. Apart from handling her own affairs, Dafrose spends much of her weekends attending ceremonies associated with the many people known to her. Actually, she invited us to her granddaughter’s wedding that was taking place that weekend following our interview. Dafhrose tells us she has WhatsApp groups “Family Masaka” and “Family Urumuri” in which the now grown up men and women speak. In the village where Dafhrose lives in Nyagatare town, she is the village head – a position her neighborhood keeps voting her to keep. The soldier in her remains intact despite her age. She speaks with firm authority. Dafhrose had actually just ended her village meeting when we arrived. We have been told that recently a criminal attacked a neighboring village wielding a knife. As the males shied away in fear of the man, it is Dafhrose who neutralized the criminal. Why did she leave the army yet she was an officer? Dafhrose says she felt she had played her part and it was time for a new generation to take on the mantle. She retired in 1997 at the rank of Captain. On what she feels about the fact that even her former commander President Kagame stopped by her photo, Dafhrose is clearly enjoying the fame. She shows us WhatsApp messages from family members and comrades with whom they are in contact. For days that followed the launch of the museum, they shared her the Kagame photo. She also displays to us photos sent to her picked from Facebook and Instagram in which the owners of the account had visited the museum and taken remembrance picture before the Dafhrose image. May God bless this woman I lost something else to say, I’m crying! Very interesting article, attractive content, exclusive.I like that as It keeps someone reading! I know her very well. She was best friends with my mom when I was growing up. She has a golden heart.